A gently shaped, diamond set ring crafted from precious 9ct white gold. A subtle twist on a classic diamond wedding band. Designed to perfectly fit the beautiful diamond solitaire under product code 9219250. 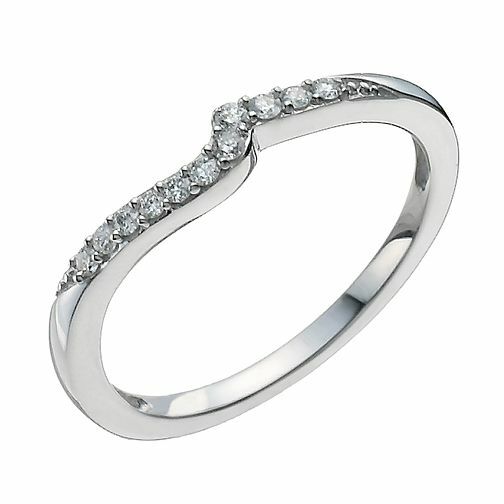 9ct White Gold Shaped Diamond Ring is rated 3.3 out of 5 by 3. Rated 3 out of 5 by Anonymous from Disappointed This ring fits very closely to my engagement ring hence choosing it but i am very glad i got the insurance as when i sent it in for a polish and clean i was told the stones were at threat of falling out so they fixed it. Within a few weeks the colour faded much faster than it had the first year, i was told i could send it again but i decided to wait as i was advised the colour fades much faster each time anyway. I sent it in for a check up in the second year and was told as the repairs were going to be over my insurance allowance (as again the stones were under stress, it needed a polish and re dip and also the thin band needed to be thickened as it had worn thinner-all of this is a lot of wear for someone who takes good care of her jewellery and doesn't have a manual labour job) so they would replace the ring and i would lose the remainder of my insurance (approximately a year) which i found quite disappointing. I was offered the option to purchase more insurance for the new ring which i felt i needed to do since the ring clearly would not/will not last in the long run. So i feel that every two years this ring is going to need replacing or good money spent on it continuously. Meaning the ring that held such sentimentality as being the ring from my wedding day will either fall to pieces or cost me a fortune to maintain. I wish this was something that could've been mentioned when purchasing the ring initially. I recommend purchasing a more sturdy ring and quite possibly something without stones if you wish to keep your original wedding band.